1. The creation of a wax model requires considerable documentation. 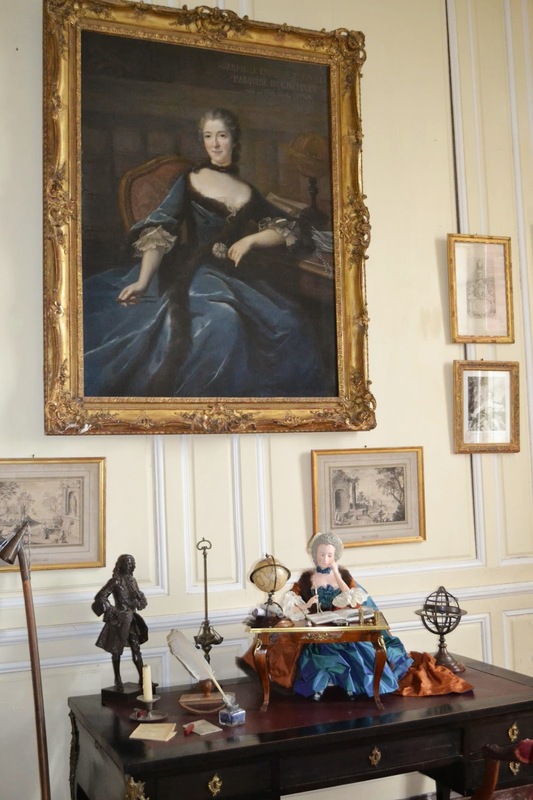 The reference point for the new waxwork was the portrait by Marianne Loir in the Musée des Beaux Arts in Bordeaux; the château itself has a fine eighteenth-century copy in its collections. The work of Elisabeth Badinter and Judith Zinsser on the correspondence and archive sources, revealed Madame du Châtelet to have been a strong personality who freed herself from social conventions and attracted many enemies. 2. Information was carefuly gathered on her physical appearance - colour of eyes and hair; shape of the face. The mannequin's hair was created by Any d’Avray a Parisian firm which specialises in theatrical wigs. The wigmakers were struck by the natural style; the hair was tided up in a simple chignon, with some locks left curled and loose on the shoulders. Elodie Pommelet, a theatrical make-up artist, did the make up; this too was quite natural, though with the use of powder as was the fashion for both women and men of the eighteenth-century nobility. 3. The costume was made by Pascale Breyne of the Troupe du Crâne (a theatrical company which specialises in period comedies). The dress is dark blue velvet, with detachable lace cuffs and fur trimming. This style of loose gown, called a "robe battante", was popularised by Madame de Montespan and was fashionable in the first half of the eighteenth century. 4. The tableau was designed by the Marquis de Breteuil himself and his adviser Christophe Leray to present Emilie informally at work on her scientific studies. 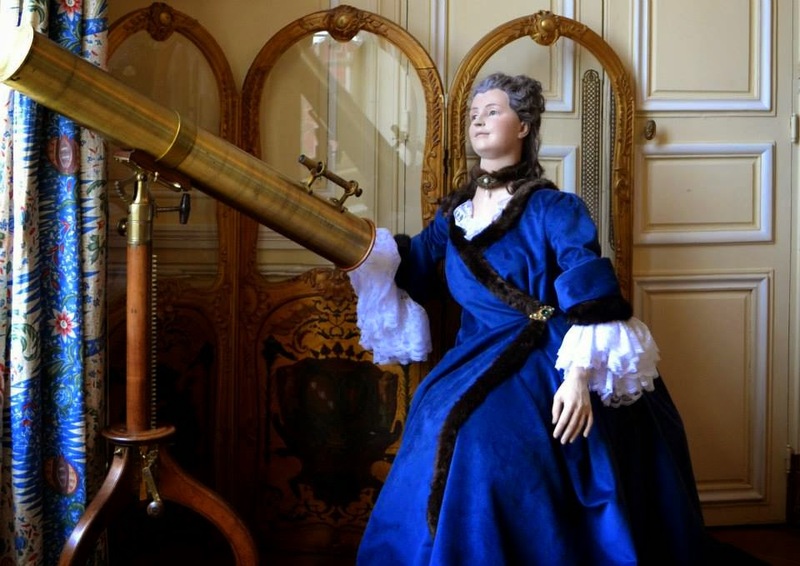 The wax statue was positioned in front of an eighteenth-century telescope as though observing the stars. The screen, a family heirloom, was created from her actual sedan chair, with its gold decoration and the coats-of-arms of the Châtelet and Breteuil families.